Use the High-Speed Graph to visualize larger amounts of data over short time periods. After adding the High-Speed Graph to your Screen and adding any channels to the graph that you want to view, complete the following steps to customize your graph properties. To adjust visual properties of the chart or add/remove channels, click anywhere on the chart and use settings on the Item tab. Visible length cannot exceed the history length total buffer size. 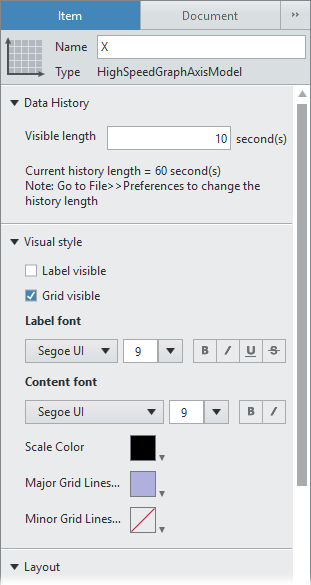 Refer to the Setting the Graph History Length topic for information on how to adjust the default history length. To adjust the axis options or pause/restart the data visualization, right-click the chart to access the configuration options. To customize the axis visual settings, click on the axis you wish you change, and use the settings on the Item tab. To customize axis behavior or position, right-click the axis you wish to change access the configuration options. 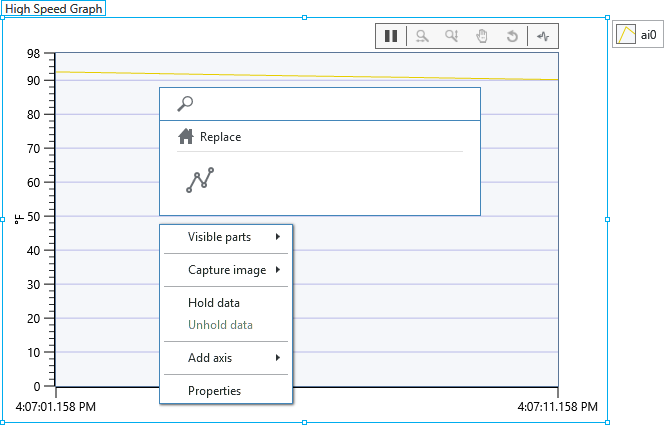 Click on the hold and pan controls to pause the visualization and analyze the graph history. 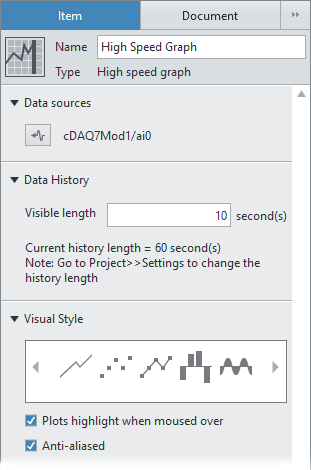 The amount of data you can pause and view is determined by the High Speed Graph history length. 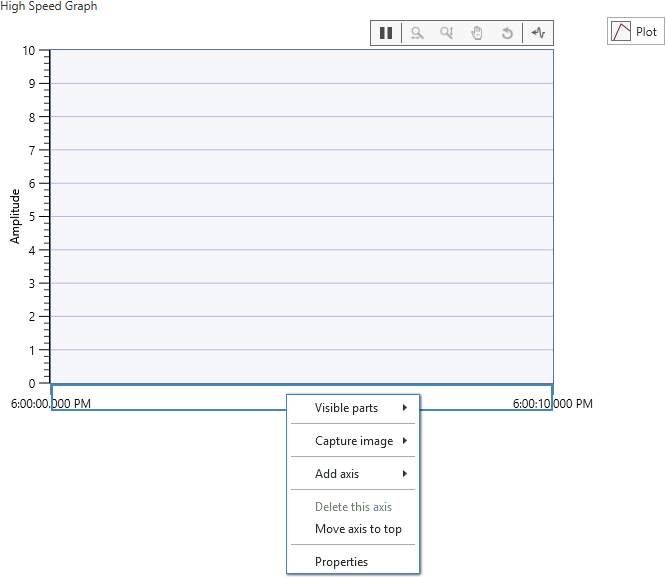 Refer to the Setting the Graph History Length topic for information on how to adjust the default history length. 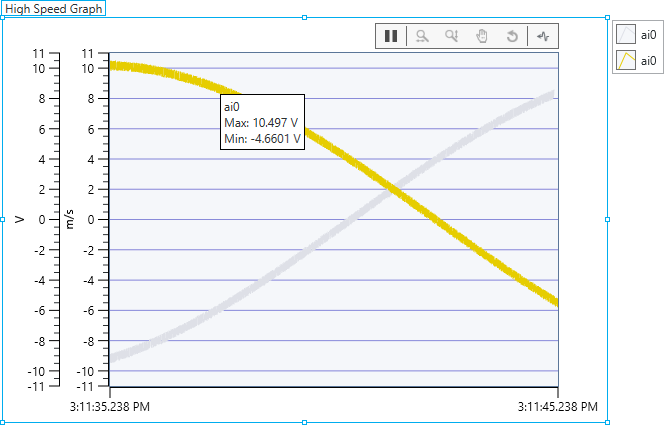 To see the maximum and minimum data values within the visible graph range, hover over any channel on the graph. The Max/Min value automatically appears on the plot for that channel.